The feature of Catholic art is splendor, overwhelming the viewers. In contrast to the simple Eastern Orthodox art, the differences in ways of viewing arts depending on the denomination can be seen. The motive force for Catholic art to flower is in the Renaissance (see below), the revival movement of classical culture in Florence. Renaissance itself was not for the development of Christian art but at this time many artists called genius began to try new techniques of expression, which had been reflected in Christian art as well. It is the technique of expression called realism. In addition, as the color had pursued three-dimensionality, it became subtle and rich. As the realistic expression was required on the background, it gradually became gorgeous and different from the previous expression with golden color. 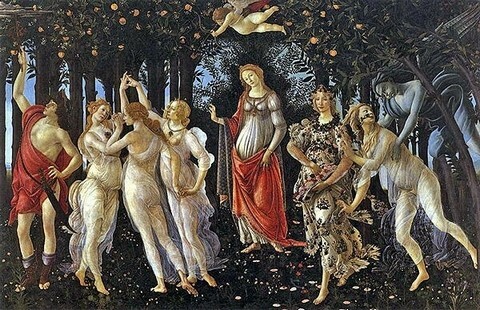 This direction of art can be also found in works of notable Leonardo da Vinci, Michelangelo, and Botticelli. They were never religious artists, but just the leaders of the Renaissance art. On the other hand, when they made religious arts, they often used many realistic and three-dimensional techniques as new techniques of expression, like they did on other works. Thus, with the activities of the geniuses, the Catholic art became gorgeous steadily and overwhelming for people.